There are many things to do in Loch Lomond, and it is a popular weekend destination for locals from Glasgow and Edinburgh in search of nature and outdoor activities. Loch Lomond & the Trossachs National Park was Scotland’s first national park, designated in 2002. The national park contains a diverse geography that includes 21 munros (Scottish mountains), two forest parks, 22 lochs, and over 50 designated special nature conservation sites that are home to a variety of wildlife. Loch Lomond itself is the largest inland stretch of water in Great Britain by surface area. Visitors can go cruising on a lake in a historic steamship, rent a canoe or kayak, spend a day visiting small villages, see Rob Roy’s gravestone, have fun at an aerial adventure park, or go climbing or biking. If you enjoy hiking, there are a number of short and moderate hiking paths to enjoy here, and a few of Scotland’s popular long distance paths such as the West Highland Way and The Three Lochs Way run through here. 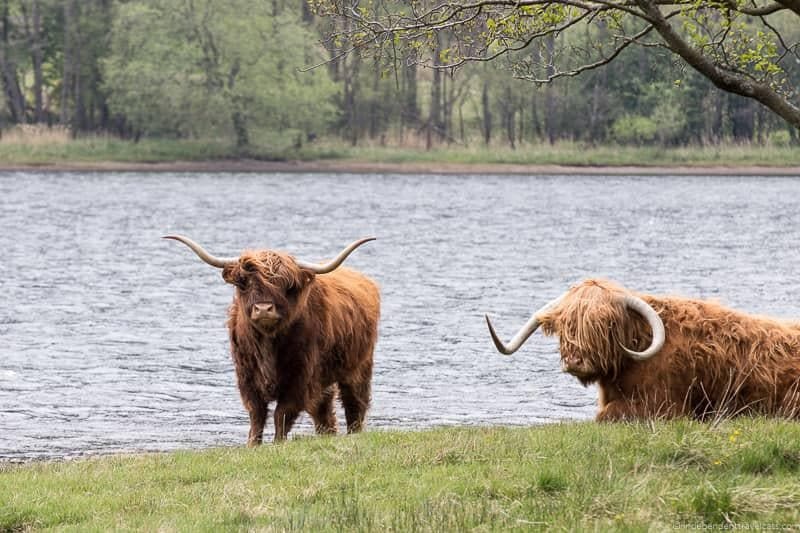 If you are visiting Glasgow or Edinburgh and are looking for scenic landscapes or outdoor adventure, you might consider a day trip to Loch Lomond & The Trossachs National Park. We’ll share our top things to do in Loch Lomond and provide tips about visiting the area based on our own visits. Best Time of Year to Visit Loch Lomond? Where to Stay in Loch Lomond? Where to Find out more information about Loch Lomond? 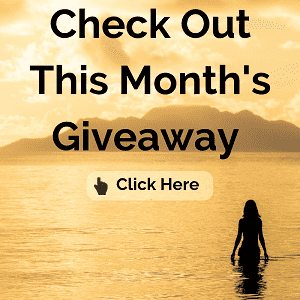 We’ll share how to get to Loch Lomond, how to get around Loch Lomond, where to stay, when to visit, and where to find further resources on planning your trip. Loch Lomond makes an easy day trip or weekend trip from Glasgow (25 miles) or Edinburgh (78 miles). If you are flying into Scotland, Glasgow Airport is the nearest airport with the best connections to Loch Lomond. Rental cars are easy to hire at the airports of Glasgow, Edinburgh, or Inverness. The area can be reached by car, train (check ScotRail or Trainline for service), bus (check National Express for service), or seaplane (check Loch Lomond Seaplanes services here). If you don’t have a car and would prefer to have a guided visit, it is also possible to take a bus tour that visits Loch Lomond such as this tour we did from Edinburgh that included a visit Loch Lomond and two whisky distilleries. You can see a number of small group tours to Loch Lomond from both Edinburgh and Glasgow by Rabbie’s Tours. The easiest way to get around Loch Lomond is by car or bus, although you can also get around the area by train, bike, hiking, waterbus, or boat although you’ll be more limited in where you can visit. Local train services are through ScotRail and there are a number of local bus services. For more info about getting around Loch Lomond see the national park website. It depends on what you want to do in Loch Lomond as there are things to do in the park all year round. However, some of the attractions and businesses are seasonal, especially the water related activities, campsites, and boat cruises. The most popular time to visit is between April and October as there is warmer weather, longer daylight hours, and more attractions are open. However, if you are seeking solitude, cycling or hiking off-season can be a great time to get out into nature without any crowds and many people love to see the snow-covered landscape in the winter. You’ll find festivals and special events throughout the year and during Christmas and Hogmanay (New Year’s) you’ll find holiday celebrations throughout Scotland. To make the most of a trip to Loch Lomond, we would definitely recommend spending a night or two to see the highlights of this area. I would do a little research first to see what you want to do in the park so you can determine the best area to search for lodging. The most visited parts of the park are probably the south and west, and that section has the highest number of tourist attractions and services, but all areas of the park are worth exploring depending on your interests. If you only have a day or two, I’d focus on an area or two of the park you want to explore. Some places with more lodging include Callander, Balloch, Luss. If you want to stay south of the park, you could also consider Helensburgh. You could also day trip from Glasgow or Edinburgh but we’d recommend spending the night if you have the time. Accommodation options around Loch Lomond range from small hotels and bed-and-breakfasts to campsites and cottages. To search and compare prices for hotel, apartments, and B&B options you can check to see what Loch Lomond lodging is available during your visit. 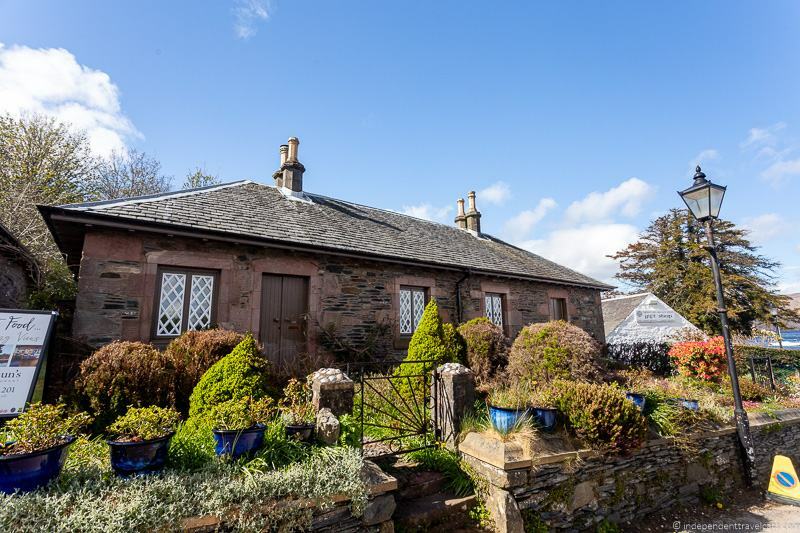 We can personally recommend the refined but cozy Loaninghead B&B in Drymen for those looking for a peaceful B&B experience with a great breakfast. 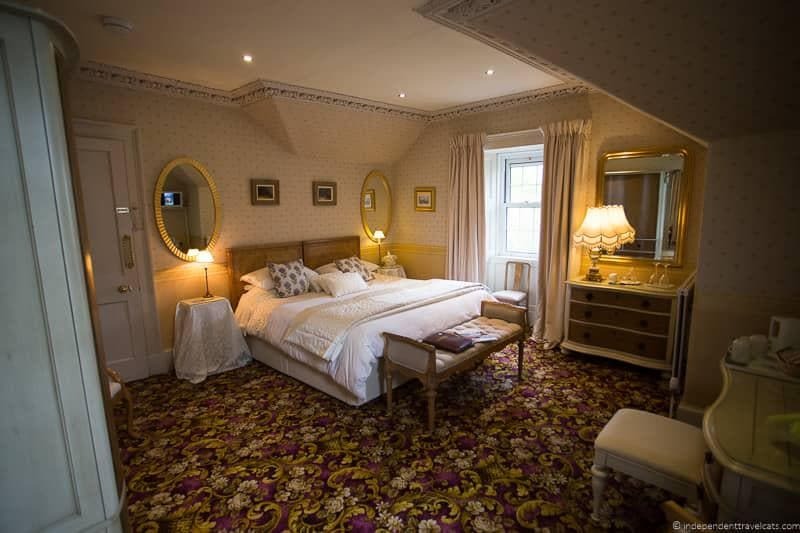 Some other options we suggest checking out are Shandon Farmhouse Bed & Breakfast (cozy farmhouse B&B) in Drymen, Loch Lomond Arms Hotel (traditional village inn) in Luss, Woodvale (well-rated B&B) in Balloch, and Queen of the Loch (hotel with on-site restaurant) in Balloch. If you are looking for a self-catering options, there are lots of apartments, holiday homes, and private rooms you can book around Loch Lomond. To get started, we’d recommend checking out holiday homes on Booking as well as Airbnb which offers a variety of apartments, homes, and private rooms to get started on your search. If you are new to Airbnb, you can get USD $20+ off your first booking by signing up here. A couple of options, both in Drymen, are Loaninghead Holidays (cozy well-furnished holiday cottages located next to the recommended Loaninghead B&B) and Luxury Lodges which are luxury self-catering cottages with private hot tubs. Many of the self-catering spots and nicer B&Bs are listed as luxury properties such as Luxury Lodges mentioned earlier. For those looking for a bit more luxury and a resort style experience, I’d recommend checking our the 4-star MacDonald Forest Hills Hotel in Aberfoyle and the 5-star Cameron House in Alexandria. Both of these hotels offer a swimming pool, an on-site restaurants and bar, recreational facilities, a fitness center, and a spa. There are a few hostel options around Loch Lomond. The Rowardennan Youth Hostel in Rowardennan is a well-rated budget spot offering dormitory style accommodation. For those planning to camp, there are plenty of areas you can do so within the park and nearby. You can check on camping regulations and book available pitches and RV spots here within the national park, or check out one of these camping and campervan sites. You can go wild camping in many areas of the park but not all so do check the wild camping regulations as there have been increased regulation recently because of irresponsible campers. You also may need to obtain a permit to camp (regardless of the type of camping) in certain areas of the park, depending on the time of year. For more information about the area, we recommend checking out the Love Loch Lomond website, the local destination organization, as well as the Loch Lomond & the Trossachs National Park website. If you are planning to combine a visit to both Glasgow and Loch Lomond you can check out Laurence’s post about a 2 day visit to both Glasgow and Loch Lomond as well as the Pack More In website, which has lots of practical information and tips for visiting both places in a short amount of time (e.g., a weekend). We also have a guide to more day trips from Glasgow for further inspiration. Once in the area, we also recommend checking out one of the local visitor centers which are located in several towns throughout the area to pick up brochures and maps, as well as ask about local sites and events. Loch Lomond first became a popular tourist destination after being featured in Sir Walter Scott’s Lady of the Lake and even Queen Victoria would make a stop here. This area continued to gain in popularity for its natural beauty, becoming the first national park established in Scotland. There are a lot of things to do in Loch Lomond & the Trossachs National Park and the surrounding area around the park. Loch Lomond is a popular spot for nature lovers and is a popular weekend escape for locals from Glasgow, Stirling, and Edinburgh for a couple of days of outdoor pursuits.The top things to do in the area involve outdoor activities, such as hiking, boating, kayaking, fishing, stargazing, climbing, camping, and cycling. But there are also other things to do such as challenging yourself at adventure parks, visiting historical and cultural attractions, exploring small towns, whisky distillery tours, golfing, and buying local produce at farmers’ markets. 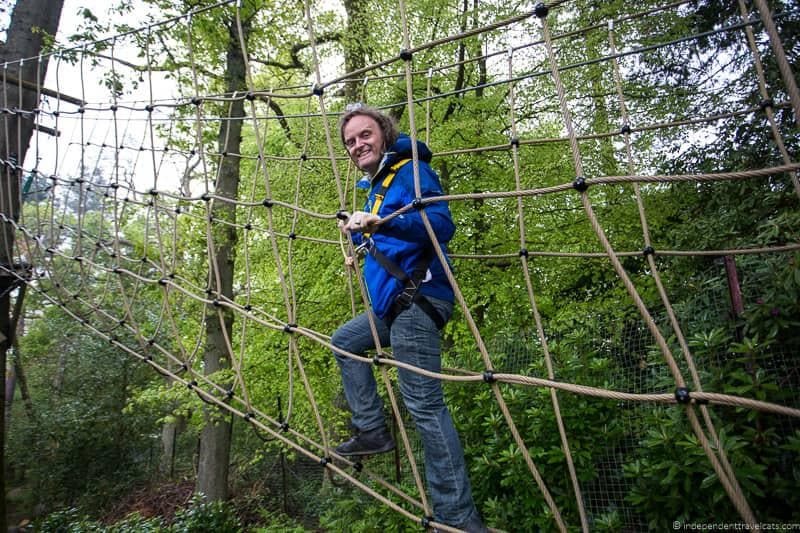 The area also offers plenty of family friendly activities with nature parks, an aquarium, canoeing, mini golf courses, aerial courses at adventure parks, guided family activities, and more to keep both children and parents entertained. Whether you are looking for a pleasant lochside stroll or a strenuous multi-day hike, you’ll likely find a trail or path of interest at Loch Lomond. Many of Scotland’s most popular hiking trails run through this area, including the long-distance trails West Highland Way, Rob Roy Way, and The Three Lochs Way. There are also a number of short and moderate hiking paths to enjoy here which include country parks (e.g., Balloch Castle and Mugdock Country Parks), old railway lines, lochside paths (e.g.,Clyde Sea Lochs Trail), and forest treks. I’d check at the local tourism information offices or with your lodging for the best paths near you. 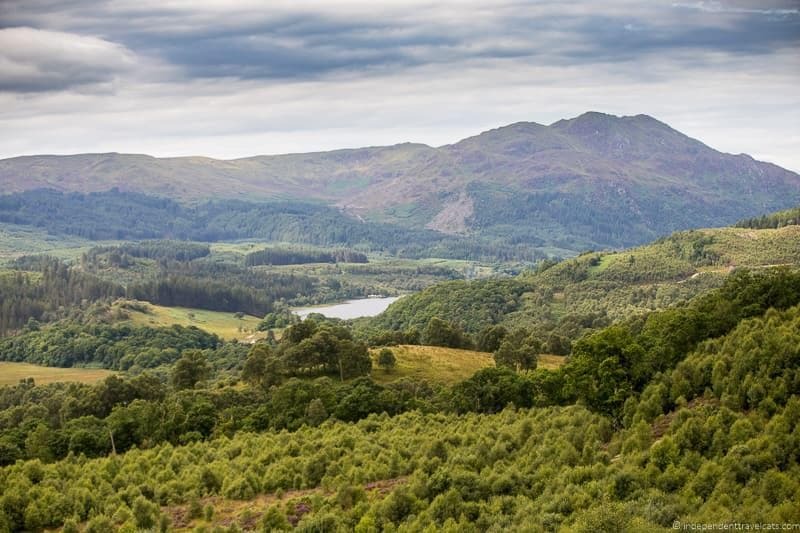 For those looking for hilly forest paths, we can recommend Queen Elizabeth Forest Park in the southeast part of Loch Lomond & the Trossachs National park which offers some wonderful scenery and views. If you are exploring the west side of the national park, you can alternatively visit Argyll Forest Park which also offers some lovely woodland scenery. For those interested in climbing or bouldering, you can also find sites that are well-suited to climbing in Loch Lomond. 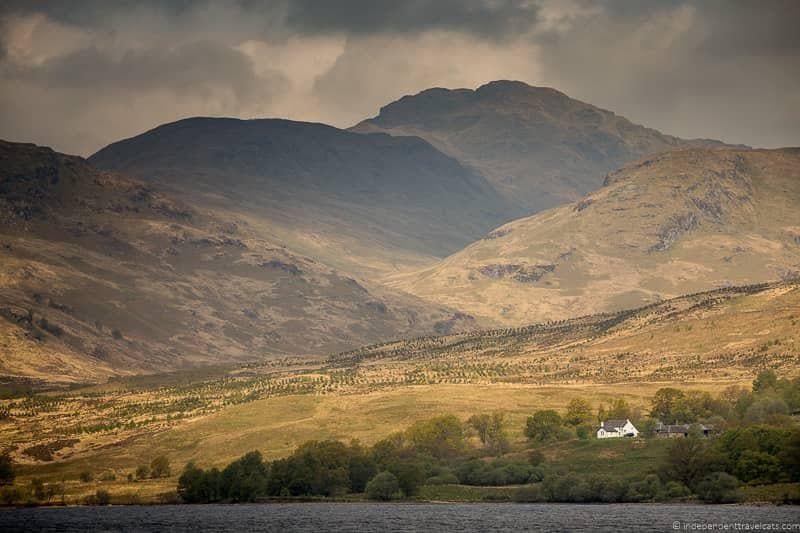 There are 21 munros (hills or mountains over 3,000 feet high) within the park, and Loch Lomond is a popular spot for munro baggers (those trying to summit all the munros in Scotland) with several relatively easy to hike ones here for the less hardy adventurers. For those planning to do a lot of hiking or any long-distance hiking, we’d recommend getting a good hiking map. We personally recommend the Ordinance Survey maps for the area(s) of Loch Lomond National Park you plan to go hiking. There are OS 1: 50,000 scale Landranger maps (good for those planning to stick to established hikes and paths) as well as the OS 1:25,000 scale Explorer Maps for those wanting to explore beyond the paths. For those with limited mobility who want to explore some of the trails, you can check out these trails and towns that have all-ability paths and trails. Cyclists and mountain bikers also have a lot of options around Loch Lomond. There are a number of cycle routes around Loch Lomond, and you can choose from easy, mostly flat paths to more difficult mountain bike trails. One of the more popular bike paths is the West Loch Lomond Cycle Path which is suitable for leisure cyclists and families. 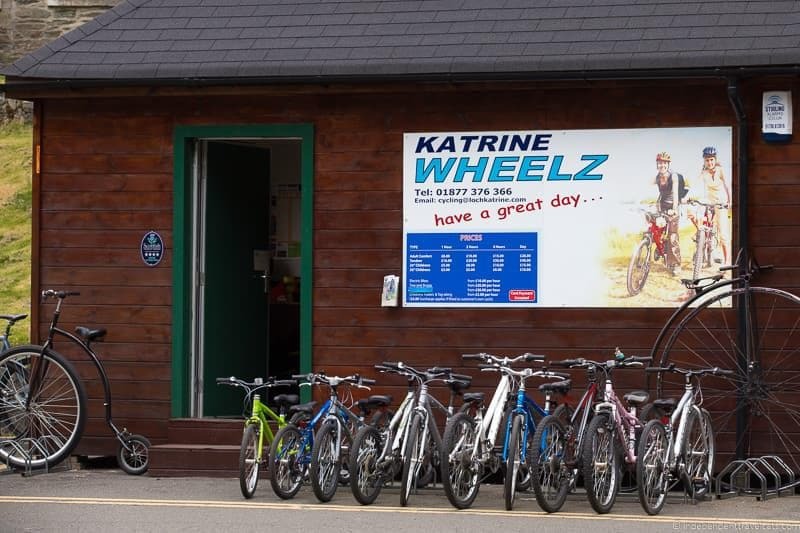 If you are not bringing your own bike, you can rent bikes from several places in the area including Katrine Wheelz, Go Country, Loch Lomond Leisure, Wheels Cycling Centre, and In Your Element. Some of these companies also offer guided cycling and mountain biking tours. You can also combine a day of biking and boating as many of the sightseeing cruises on Loch Lomond and Loch Katrine allow bikes and some even come with a bike rental option as part of the price. One of the most popular activities for first time visitors to Loch Lomond is to explore the area with a sightseeing boat cruise. Although there are a number of lochs in the area, the two most popular for boat cruises are Loch Lomond and Loch Katrine. For Loch Lomond, the family-run Sweeney’s Cruises have been offering sightseeing cruises of Loch Lomond for over 100 years, and they also offer a seasonal daily waterbus service and private boat charters. There is also the Maid of the Loch paddle steamer, built in 1953, that operates on Loch Lomond run by the Loch Lomond Steamship Service. 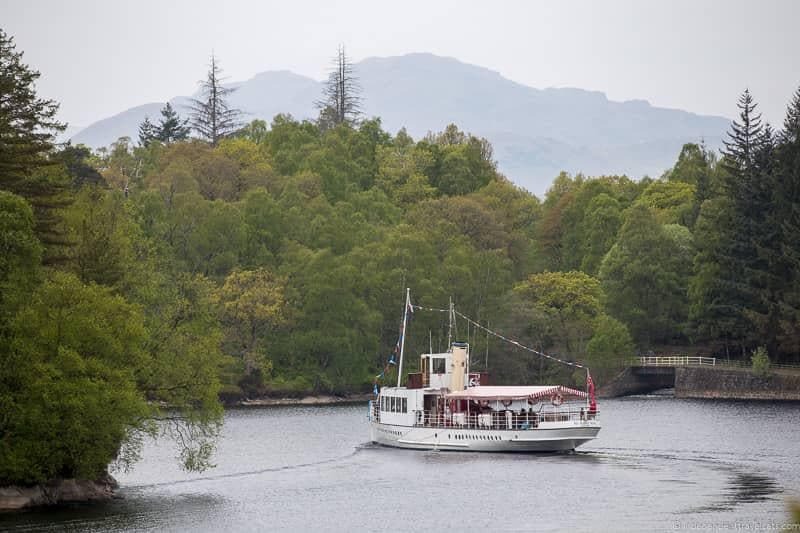 You also have several options on Loch Katrine, including the famous historical steamship Sir Walter Scott built in 1900 and the cruiser Lady of the Lake. 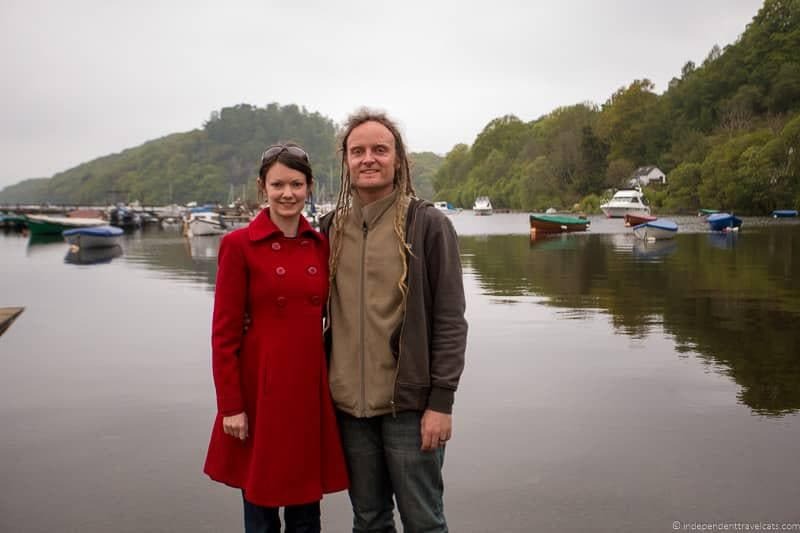 As a fan of Sir Walter Scott, I couldn’t visit the area within doing a trip aboard the steamship Sir Walter Scott on Loch Katrine, a setting for his narrative poem Lady of the Lake. No matter what cruise you do, you’ll get some nice views around the loch and most offer commentary in English and serve refreshments on board. We cruised on a chilly morning and we were happy to sit with our hot chocolate and enjoy the cruise. This was followed by a simple hot lunch at the Brenachoile Cafe Restaurant which is located next to the pier. Many cruises also offer the ability to take your own bike aboard or hire a bike so you can return by bike or do some biking before returning to the boat. Loch Lomond & The Trossoachs National Park contains 22 lochs and 39 miles of coastline around three Clyde sea lochs so it should be no surprise that many people visit this area for a bit of time on or near the water. In addition to the sightseeing boat rides mentioned earlier, the area offers the opportunity for boating, fishing, kayaking, canoeing, sailing, swimming, windsurfing, paddleboarding, seaplane rides, and even river sledging. If you plan to go swimming, you’ll need a wetsuit and appropriate gear as the water is never really warm! 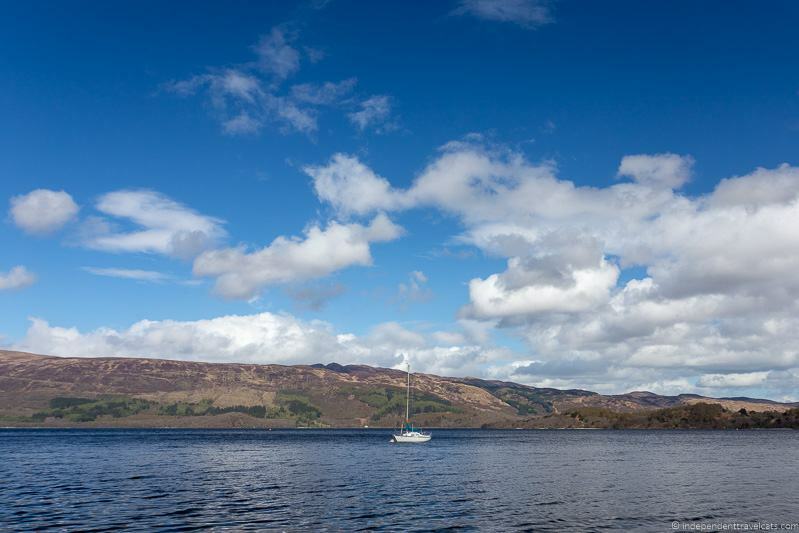 In the area, it is easy to rent boats, wetsuits, lifejackets, canoes, paddleboards, and kayaks, such as from Loch Lomond Leisure or In Your Element. Both of the above companies also offer guided water adventure activities such as kayaking, canoeing, canyoning, and river sledging. If you are planning to fish, you’ll need an angling permit (check out info for angling guidelines and permissions) and for guided fishing tours (gear included) check out the Lomond Angler. If you love adventure parks, then you’ll be happy to know that you’ll have your choice of adventures parks in this area. The two main ones are GoApe in Aberfoyle and TreeZone in Balloch. Both offer treetop aerial courses that are appropriate for older children and adults, but do check age, weight, and height requirements before you go. Laurence did the course at TreeZone and had a great time despite rain, and found the course to be both challenging and to have a great easy-to-use safety system. If you go to Treezone, you’ll park at Loch Lomond Shores, where you’ll also find a SEA LIFE aquarium, a birds of prey center, boat hire services, picnic area, and the Loch Lomond Shores shopping center. It is an easy place to spend an afternoon, and is an ideal spot to stop for families. For miniature golf, you may want to stop at Jurassic Parrr in Clydebank. If you enjoy wandering through small towns and villages, there are many to choose from scattered throughout the Loch Lomond area. 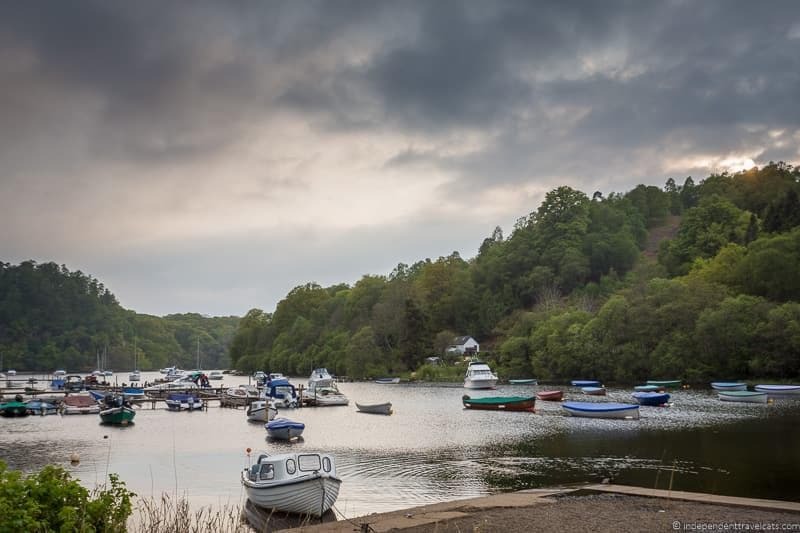 Some of our favorites to explore are Callander, Luss, Balloch, Killin, and Carrick Castle. 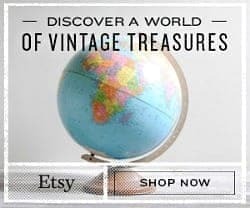 You should stop and explore a few and find your own favorites. Many towns have small tourist information offices where you can pick up a map and explore the local historic sites, walking paths, and attractions. A favorite for many visitors is Luss, which is a scenic conservation village located along the shore of Loch Lomond. It has picturesque village houses, a sandy shoreline, cobbled streets, and several small shops. It is a pretty village and fun to explore, especially on a sunny day, but it can get busy as many bus tours stop here. During your stay, I’d ask about any local events or festivals which are always fun to attend. If you enjoy farmer’s markets, you might wan to plan a stop at the popular local Farmer’s Market at Loch Lomond Shores in Balloch, which takes places each month on the first and third Sunday. You can find fresh produce, meats, seafood, bread, sweets, soaps, and other local products at the market. Loch Lomond is a perfect place to spend a night or two away with your family or significant other in a cozy B&B, cabin, or farm stay. We personally stayed at the small and cozy Loaninghead B&B, where we had a wonderful room with a king-sized bed, views of the hills and cows, and an amazing cooked to order breakfast served on fine china! To search and compare prices for hotel & B&B options you can see what Loch Lomond lodging is available during your visit. You can also find a lot of self-catering lodges and cabins throughout the area. Camping and Rving are also popular options. You can go wild camping or book a pitch (be sure to check out the local laws) within the national park or check out one of these camping and campervan sites. Scotland is the home of golf and you’ll find a number of golf courses located near Loch Lomond. A couple are private clubs like Loch Lomond Golf Club and you have to be a member or be invited by one to play the course, but most are open to the public and offer reasonable rates and scenic courses. 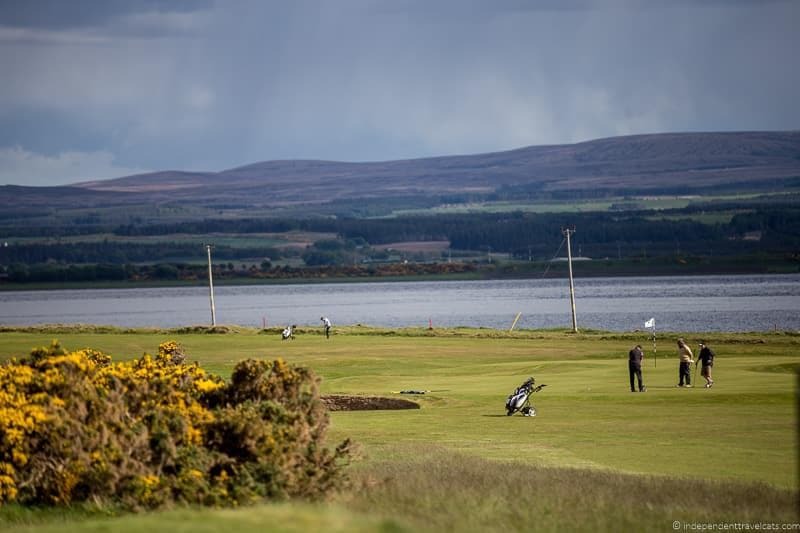 Those looking for a bit of pampering might consider playing the championship standard Carrick Golf Course and staying in the nearby Cameron House Resort & Spa. No matter which courses you are interested in playing be sure to pre-book your tee times before your visit. Loch Lomond is one of the top destinations for nature and wildlife in Scotland. Hiking, cycling, horse trails, and nature trails are plentiful throughout the Loch Lomond area and nature lovers should have no difficulty seeking out some great nature spots. The park includes such a variety of habitats—forest, meadows, wetlands, sea lochs, etc.—that it supports a wide variety of plants and animals. The area has plenty to offer for wildlife lovers including the possibility to see otters, red deer, porpoises, red squirrels, pine martens, and loads of bird species from birds of prey like golden eagles to seabirds such as gannets. You can find a number of nature trails within the forests and parks, and the RSPB (The Royal Society for the Protection of Birds) Scotland has a Nature Hub at Loch Lomond between Balloch and Drymen which is a special area of wildlife conservation. The RSPB is a great resource to contact for wildlife information in Scotland. For those seeking woodland areas, we recommend checking out either Queen Elizabeth Forest Park or Argyll Forest Park. 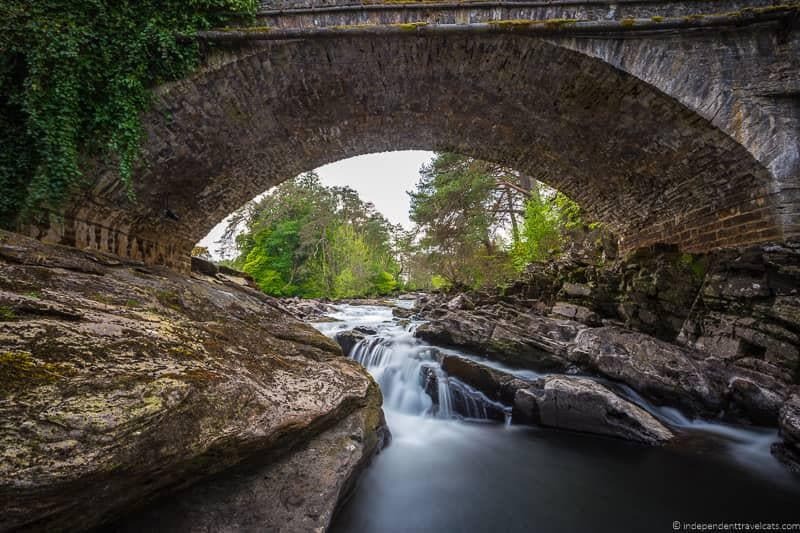 There are several waterfalls around Loch Lomond, including the Falls of Dochart, Inversnaid Falls, Bracklinn Falls, and Falls of Falloch, and waterfall lovers can have fun seeking these out, with access varying from easy walks to more strenuous hikes. 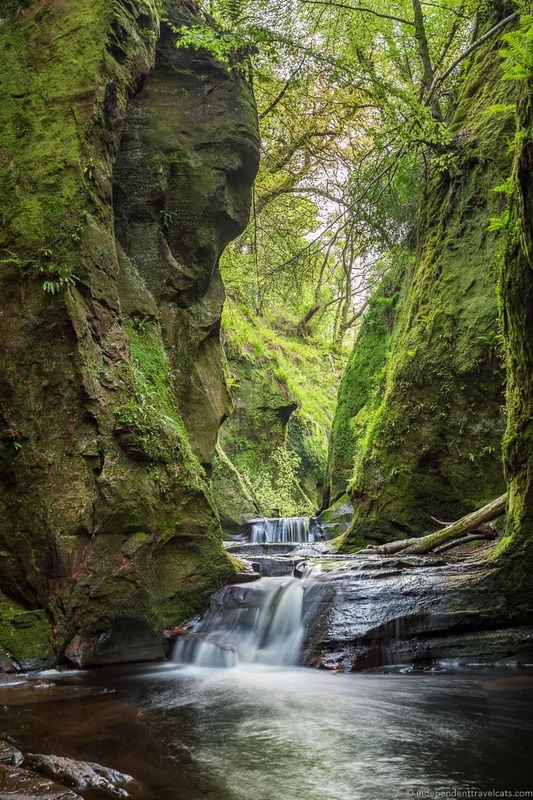 A popular scenic spot for fans of the TV show Outlander is Devil’s Pulpit, a gorge in Finnich Glen south of Drymen. If you want to visit Finnich Glen, you can follow these instructions on how to find the Devil’s Pulpit. Scotland also has some of the largest areas of dark sky in Europe, and there are several spots within the Loch Lomond national park which are especially great for stargazing on a clear night. In the winter, you might even be lucky enough to see the Northern Lights! Scotland is full of historical and cultural sites, and Loch Lomond is no exception. You can find a bit of everything from prehistoric cairns and stone circles to ruined castles to a masterpiece home of 20th-century Scottish design. Although it is not the best area of the country for culture lovers, there are some interesting thing to discover here. You can find interesting stories and history in each of the villages. For instance, the village of Tyndrum is built over the battlefield where Clan MacDougall defeated Robert the Bruce and also has an association with Rob Roy MacGregor. 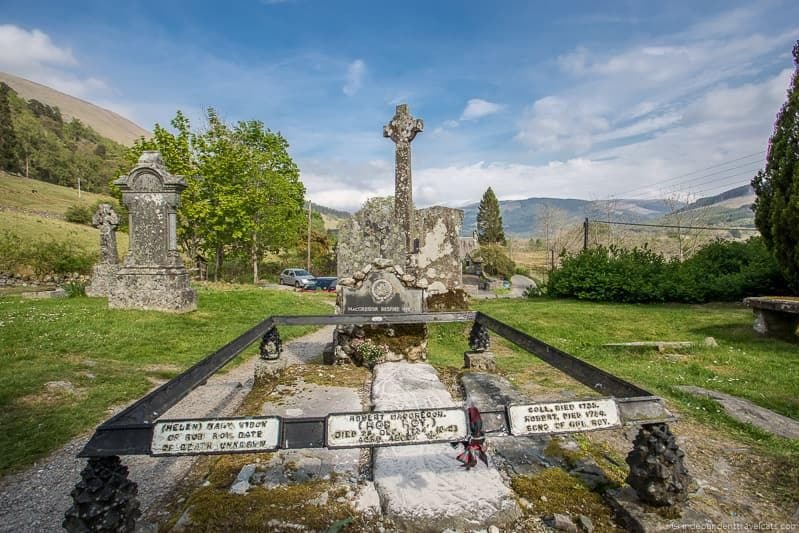 Those interested in Rob Roy may want to stop to see his gravestone at the Balquhidder Parish Church. There are a number of heritage trails you can follow at several of the towns, including Killin, Luss, and Callander which include interpretation panels. 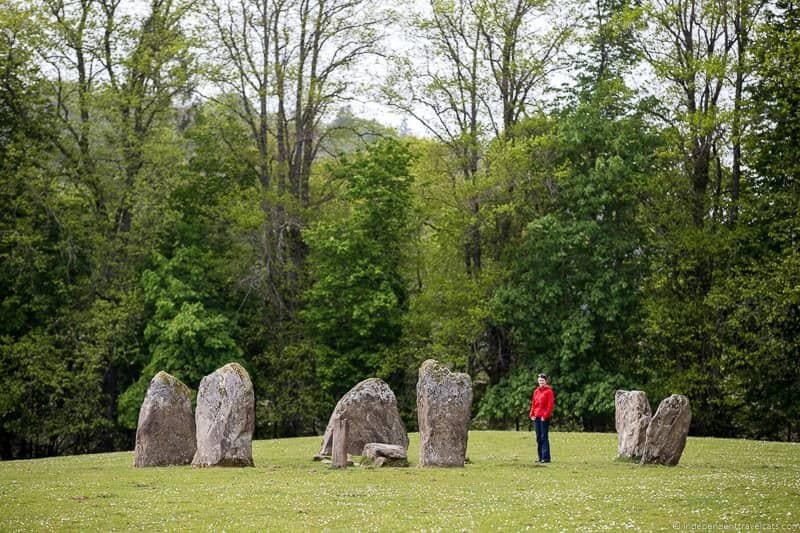 Art and literature lovers may want to explore The Great Trossachs Art & Literature Trail which highlights the artists and writers, such as Sir Walter Scott and William Wordsworth, who visited and drew inspiration from this area. 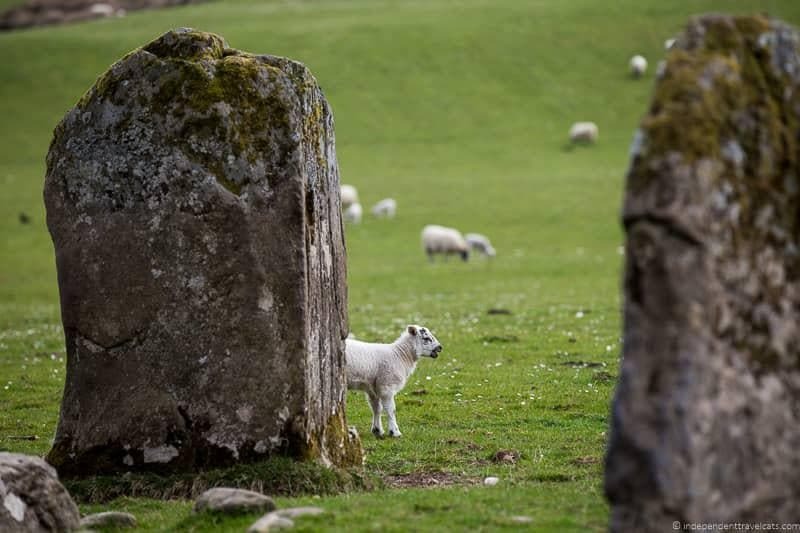 Those interested in prehistoric to medieval history can find ruins and remnants throughout the area, such as the Auchenlaich Cairn, a neolithic chambered cairn, near Callander, the Kinnell stone circle in Killin, and the ruins of Strathfillan Priory in Kirkton, between Crianlarich and Tyndrum. You can visit small museums such as Denny Tank in Dumbarton, where you can learn about shipbuilding and see the world’s first commercial ship model experiment tank. 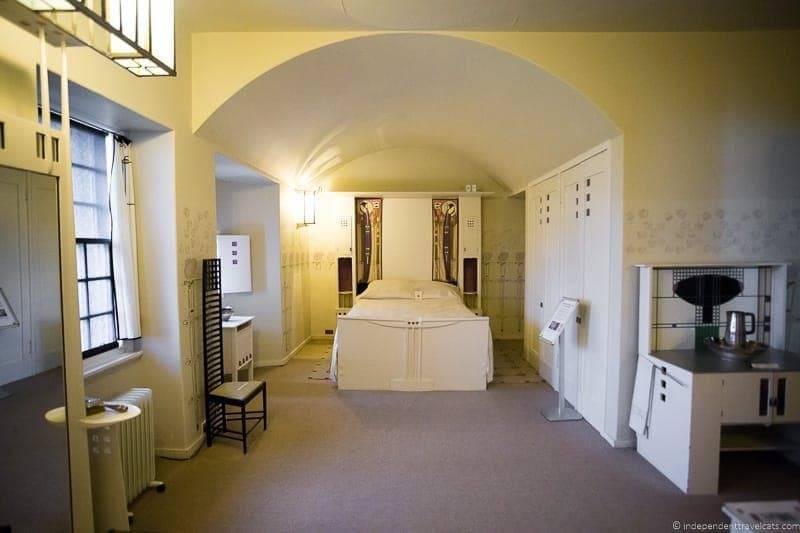 Architecture and art lovers will want to make a stop at Hill House in Helensburgh to visit one of the domestic masterpieces from Scottish architect Charles Rennie Mackintosh. Visitors may want to visit Dumbarton Castle, which is now a ruined castle but the park contains a Georgian governor’s house with artefacts, 18th-century artillery fortifications, and scenic views of Ben Lomond. Similarly, Balloch Castle Country Park is a former 19th century private estate where visitors can discover a variety of gardens and parkland and see the castle (although the interior is not open to the public). 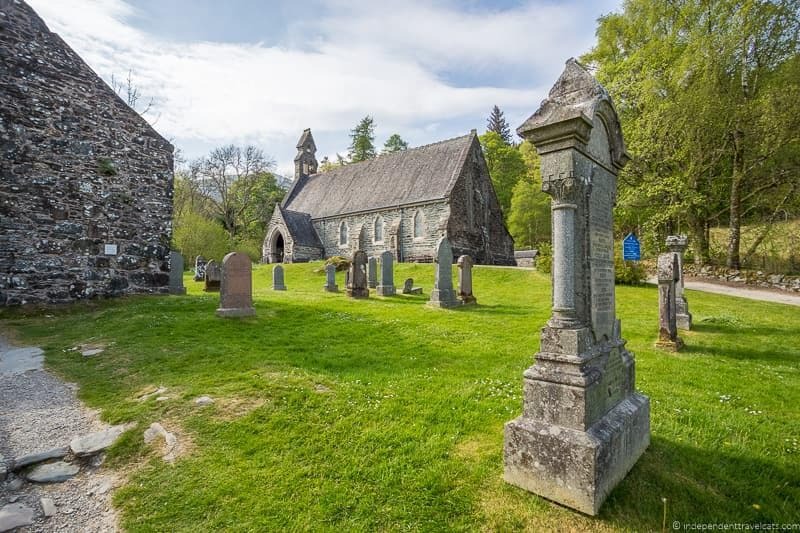 Garden lovers exploring the western side of the park might want to make a visit to the Benmore Botanic Garden and those interested in old churches may want to make a stop at the nearby St Munn’s Church and Argyll Mausoleum in Kilmun. Most visitors stop for a whisky tasting and/or tour at some point during their first trip to Scotland, and this area can be a perfect place to do just that. 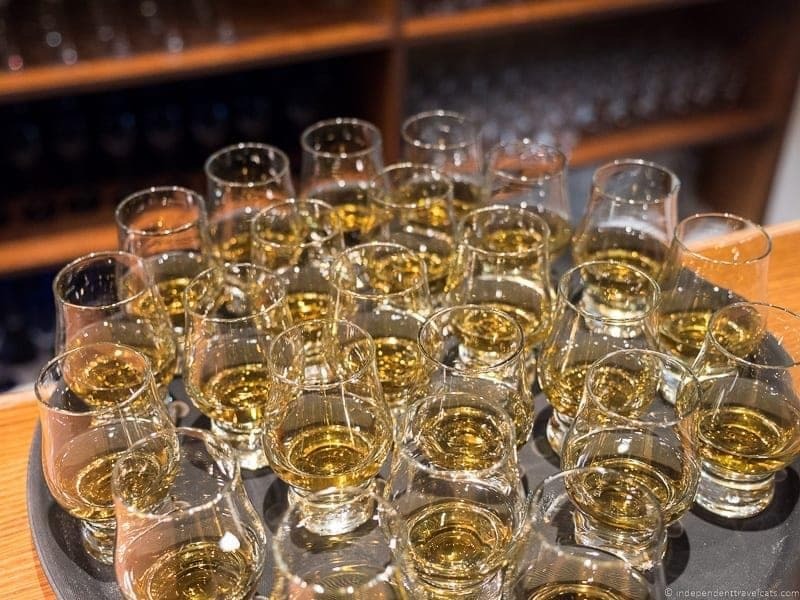 You’ll be able to taste local whisky at just about any pub or bar in Loch Lomond and most bartenders should be able to offer some advice and guidance if you are new to whisky. But you can also head to one of the local distilleries if you want to see how it is made. None of these are actually located within the national park, but all are a short distance away depending on which part of Loch Lomond you are visiting. The three closest that offer public tours are Glengoyne near the village of Strathblane, Auchentoshan in Clydebank, and Deanston in Doune. All of them offer whisky tours, tastings, and the opportunity to buy whisky to take home with you. 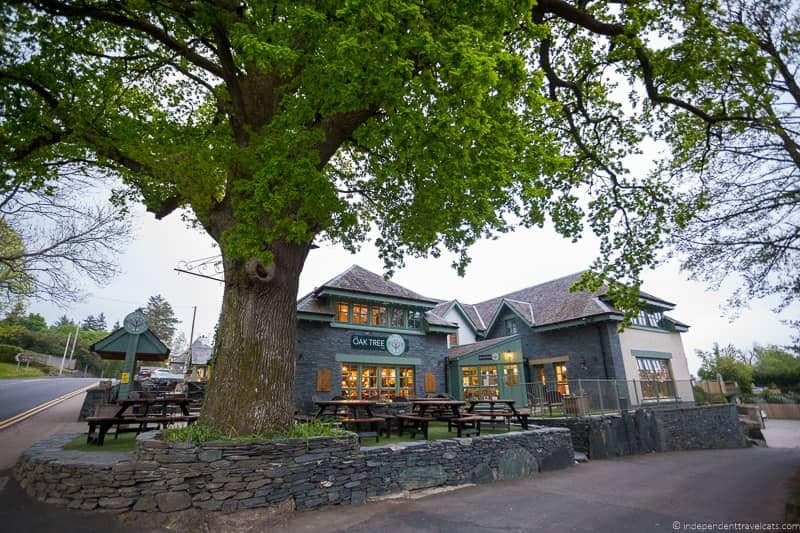 If you prefer beer to whisky, you might want to try a beer or cider from Balmaha Brewing Co. brewed at the Oak Tree Inn or beer from the family-run Loch Lomond Brewery which you’ll find served and for sale throughout the area. Loch Lomond Brewery offer a variety of beers and can sometimes give brewery tours if you contact them in advance. So there is our list of things to do in Loch Lomond & the Trossachs National Park! Have you visited Loch Lomond? If so, do you have any places you’d add to this list? If you haven’t visited yet, would you add Loch Lomond to your Scotland itinerary? As always, feel free to ask us any questions you may have about things to do in Loch Lomond or anywhere else in Scotland! Scotland is so beautiful! I spent a day in Loch Lomond many years ago on my first trip to Scotland and I have fond memories of my visit there. Hello, cool article. Funny Question, we are going to be visiting friends in Luss for the Highland games in July. My wife and kids wanted to go see some highland cattle. Can you please tell me where they are in the park? On the brochure it shows them. Thanks so much! HI, thanks for the information. I am planning to travel in April and stay some days in the park. Was thinking about renting a motorhome. How are the facilities for motorhome in the part? Is it a good option.? How many days would you recommend. 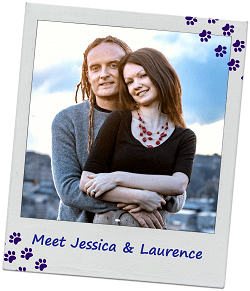 I am travelling with my husband and a daughter – 14 years old and a son – 12 years old. We like hiking and biking. Hi Denise, I have not personally been to Loch Lomond in a caravan or motorhome, but camping and caravanning in the park is very popular in the warmer months, and many sites provide good facilities. Here is a list of caravan & camp sites within the park that should help you find and book a place that best suits your needs. Note that in some areas of the park between March and September each year, camping/caravanning is only permitted in campsites or in camping permit areas. But that should not affect you as you plan to rent a proper caravan site. I’d rent the smallest size caravan that you need as with hilly narrow places in Scotland, having a smaller vehicle makes them easier and safer to navigate. I think that a camping or caravanning trip to this area is a great idea, especially if your family enjoys outdoor activities as there is loads to do for an active family (e.g., hiking, biking, boating). Your kids may enjoy one of the zip lining and adventure parks as well. In terms of how much time to spend, you can see a lot in 2-3 days, but could easily extend this to a week or more if you want to do a lot of hiking & biking and see various areas of the park. I’d recommend if you are spending more than 3 days to set up in two different caravan sites so you see more of the park. Perhaps setting up in the eastern side of the park for 2-3 days and then setting up in the western part of the park for 2-3 days. Enjoy your trip to Loch Lomond! The landscape is just stunning! It’s great that there’s much to do and see, but honestly…we’d stand there gobsmacked at the scenery! As always, great photographs. 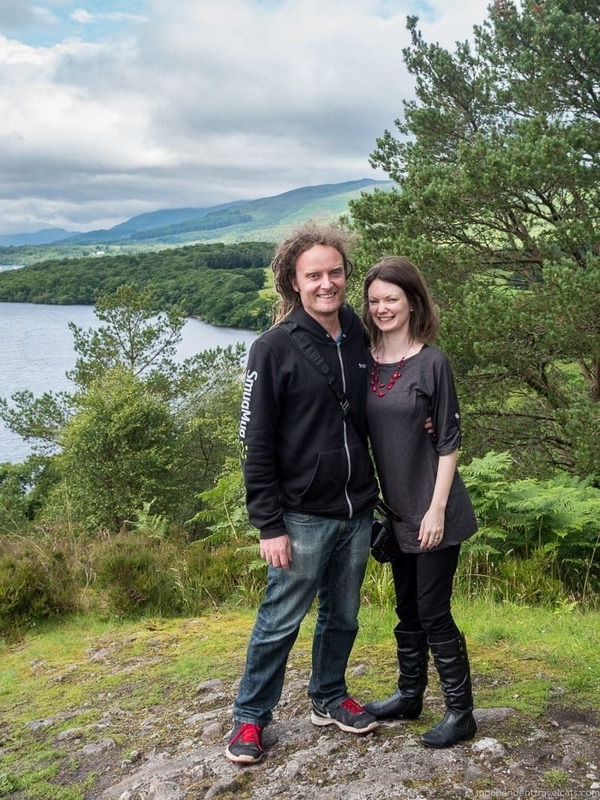 Loch Lomond, and Scotland in general, has been on our bucket list for far too long. Thanks for the great ideas to get us moving! Thank you for such a thorough post with lots of tips about exploring this National Park. Scotland is high on my list, and I love National Parks, so I so appreciate learning about this part of Scotland. Gorgeous photos! I traveled through the area on a gorgeous summer day in 2012 ( a veritable heatwave in the upper 20’s). The area is so lush and green (couldn’t miss the highland cattle). Loch Lomond is beautiful. I don’t think I have any Scottish roots, but the the area is so fascinating. Stone circles, distilleries, lambs, gorgeous waterfalls, and Rob Roy’s grave? I’m there! Thanks for linking in this week! Loch Lomond looks like an amazing National Park, and a great place to spend a weekend! I’d like to seek out nature (and get some great shots like you did) and visit some of the historical and cultural sites. I love visiting ruins! I’d also love to see some of those cows. I haven’t seen cows like that in real life. They’re pretty adorable! I would absolutely add Loch Lomond to my Scotland itinerary! Scotland is definitely on my bucket list but this makes me want to get there ASAP. Saving for later! Another great guide with lots of detailed information about Loch Lomond. 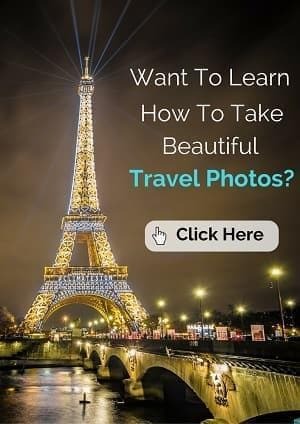 Your beautiful pictures surely make this place look very appealing. Breweries and Distilleries don’t interest me too much, but photographing waterfalls like that would. I have a lot of your posts bookmarked for future reference., so I’m going to save this one too. I’m hoping to make it to Scotland next spring. Oooh I’m in love with everything in this post!! From the plethora of lochs, to the cute cows, distilleries and beautiful hotels!! I wouldn’t mind spending a few days here!! Your photos are absolutely stunning, and really do the area justice! We’ve visited Scotland twice as a family and there is never enough time to see and do everything! We often combine travelling with cycling. I love the idea of cycling around Loch Lomond. I didn’t know you could do that. Thanks – I might add it to the holiday to-do list. I had to cut Loch Lomond out of our Scotland itinerary because we just didn’t have enough time. I hope to make it there on my next trip, it just looks lovely. I would like to take one of the sightseeing boats and also do some hiking. I”m not much of an adventure park person, but the breweries and nature hiking look good to me! My husband would be all about the golfing. Great photos of the waterfalls, by the way. My brother in law (who loves nature photography) is giving these photos the thumbs up!